41mm 18k red gold case, 18K red gold bezel, gray composite resin lateral inserts and bezel lugs, tantulum color dial, self winding HUB 4300 movement with chronograph function, approximately 42 hours of power reserve, grey rubber and gummy alligator strap with deployant buckle. Water resistant to 100 meters. 41mm 18k red gold case, 18K red gold bezel set with 114 diamonds (1.22 ct), gray composite resin lateral inserts and bezel lugs, tantulum color dial, self winding HUB 4300 movement with chronograph function, approximately 42 hours of power reserve, grey rubber and gummy alligator strap with deployant buckle. Water resistant to 100 meters. 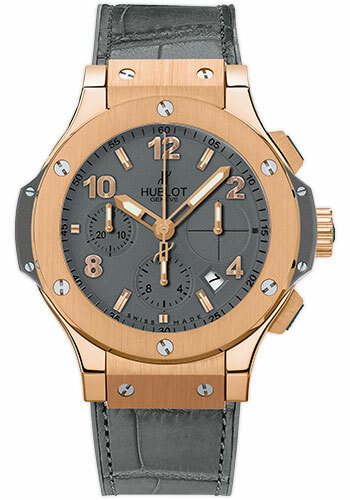 41mm 18k red gold case, 18K red gold bezel set with 48 hematite baguettes, gray composite resin lateral inserts and bezel lugs, tantulum color dial, self winding HUB 4300 movement with chronograph function, approximately 42 hours of power reserve, grey rubber and gummy alligator strap with deployant buckle. Water resistant to 100 meters. 41mm satin-polished steel case, stainless steel bezel set with 114 diamonds, tantalum color dial, self winding HUB 1145 movement with chronograph function, approximately 42 hours of power reserve, grey rubber-alligator strap with deployant buckle. Water resistant to 100 meters. 41mm stainless steel case, 18K white gold bezel set with 48 hematite baguettes, gray composite resin lateral inserts and bezel lugs, tantulum color dial, self winding HUB 1145 movement with chronograph function, approximately 42 hours of power reserve, stainless steel bracelet. Water resistant to 100 meters.